Prof. (Dr) V H Abdul Salam, was a Member, Board of Governors, APJ Abdul Kalam Technological University (KTU). He was a Member, Senate and Syndicate, University of Calicut. He is a Member, Senate, Cochin University of Science and Technology. He is also a Member Faculty of Architecture in CUSAT. 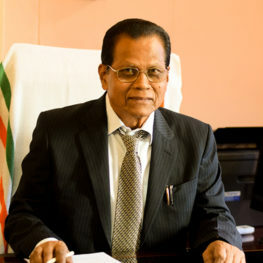 Prof. (Dr) V H Abdul Salam, obtained B.Sc. (Engineering) degree in Civil Engineering with first Rank from the University of Kerala. Secured M.Tech. and Ph.D. degrees from Cochin University of Science and Technology. His 46 years of Professional, Administrative and Academic experience include positions as Superintending Engineer in Greater Cochin Development Authority (GCDA), University Engineer (in the cadre of Chief Engineer) and Head of Engineering Department in CUSAT, Graduate Trainee in KSEB, Jr. Engineer in CPWD (Government of India). He is an approved Project Guide for UG and PG courses in Civil Engineering at CUSAT. He worked as Principal, MES College of Engineering, Kuttippuram for 10 years(from 02.04.2007 to 01.04.2017). He is a fellow of Institution of Engineers India (FIE), Life Member of the Indian Society of Technical Education (LM-ISTE), Fellow of the Indian Geotechnical Society (FIGS), Fellow of the Indian Institution of Bridge Engineers (FIBE) and Life Member of Energy Conservation Society (LM-ECS). He was awarded Good Service Entry in 1996 in recognition of his hard work and valuable contribution in the successful completion of the 100 crore Cochin Jawaharlal Nehru International Stadium Project in the record time of 515 days. He has a number of research publications to his credit. He was a Sub Committee Member of the Kerala Chamber of Commerce and Industry. He was the first Chairman, MES Udyogamandal School and MES Eastern School, Eloor, Cochin. In the year 1982-83, he worked with PDO, Muscat. He was a Member of the Managing Committee of N. Musthafa Sahib Memorial MES Charitable Complex. He was a Board Member of the Vigyan Valley Education Trust, Cochin. He is a Trustee of the Ernakulam Karayogam Charitable Trust. Dr. Abdul Salam is a native of Erattupetta in Kottayam District and settled at Ernakulam with his family consisting of wife, two sons and a daughter. His permanent address is Vellathottam, S & S Lane, Thammanam P. O., Ernakulam, Kochi – 682032, Land Phone No. being 0484-2345494. His date of birth is 28.03.1948. He has widely travelled in USA, Europe, Singapore, Middle East, Thailand, Malaysia and Maldives. At present Prof. (Dr) V H Abdul Salam is working as Director of MEA Engineering College, Perinthalmanna, Vengoor P.O., Malappuram Dist., PIN 679325 since 29.05.2017.